At the 2012 ASHA Convention in Atlanta I wondered at the unique set of peoples I encountered. Everyone was eager to join sessions, share ideas, and offer words of encouragement to the newbies like me. There wasn’t a hint of selfishness of information; what helps one professional has the possibility to help thousands more when shared. The amount of evidence displayed and excellence of clinical translation encouraged everyone who attended. Since this was my first convention, I was astounded at the amount of work others from around the country are doing to advance the science and techniques of the profession…and I thought I was busy?! 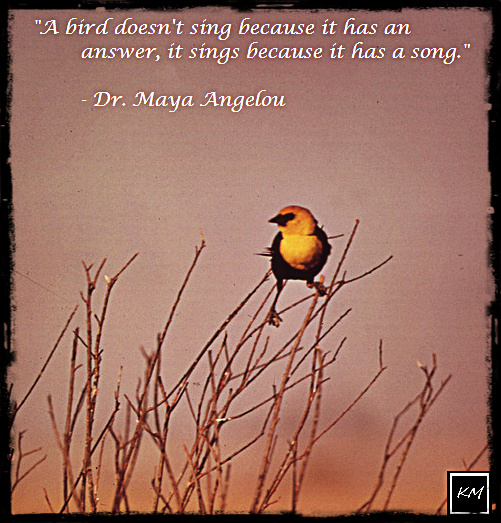 In Dr. Maya Angelou’s key note address, she said “A bird doesn’t sing because it has an answer, it sings because it has a song.” We all have a song to sing in the form of our profession. We perform our job based on evidence and training; yet it is more than that. There is a calling to help each patient, caregiver, and family, not out of a sense of duty; rather, from a sense of purpose and resolve to impact and further another person’s recovery and development. Where is all the evidence going once it is presented in sessions or posters? When a presenter outlined an idea to change an approach based on new evidence, do you feel compelled to consider it? While I have yet to fully work as an SLP, I’m developing an idea of how easy it is to become complacent in “what works”. The theme for the convention “Evidence of Excellence” hinged on the idea that evidence drives our excellence as professionals. Merely hearing the song of others’ research and results doesn’t seem like enough. Application and translation of research is what the ASHA Conventions are all about, no matter the theme. A time to gather as a profession and hear what is being done to improve and propel us all. I don’t want to sing the same song for the rest of my professional and personal life; I’m hoping I’m open enough to grow and develop along with our profession. Are you? The 2013 ASHA Convention will be in Chicago, Illinois. I plan to attend in order to let my song be heard. Will you? Whatever the theme may be, you can rest assured the people met and sessions attended will give you a new song to sing with even greater enthusiasm and excitement. See you there! !